This is an unforgettable memoir* about a young girl who, kept out of school, leaves her survivalist* family and goes on to earn a Ph.D from Cambridge University. You might say Tara Westover’s education started while she was very young. Her life began on an Idaho mountain with survivalist parents. Her father distrusts the government and runs a scrapyard*. Her mother is practically coerced* by her husband to become a midwife*. 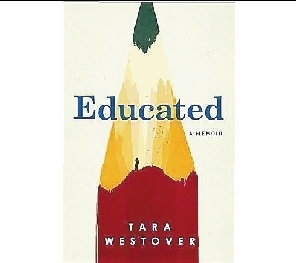 Tara Westover was 17 the first time she set foot in a classroom. Born the youngest in a family of seven, her mother must have burned out* on homeschooling by the time Tara came along because she didn’t get much book learning. Tara’s early survivalist education includes learning how to survive her parents’ ignorant* choices and a bullying older brother — all of which are much greater threats than her father’s perceived threats of the government taking over their lives. As Tara watched the insanity* and chaos of her parents’ poor choices, she had one example of life beyond the mountain. One older brother left home and went to college. He encouraged her to do the same. This book is about her quest to get out from under her father’s control — first physically, then emotionally and spiritually.